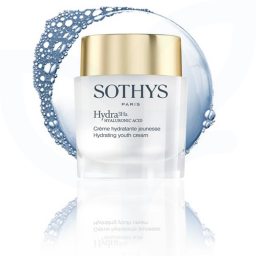 A light, instantly moisturising cream with the patented ingredient from Sothys Advanced Research. 1055 bo­le­tus ex­tract An exclusive, patented active ingredient from Sothys Advanced Research. Hyaluronic acid booster that acts on the barrier function and on moisture flow. Pro-youthfulness action. BPM hyaluronic acid + Re­struc­tur­ing ac­tive in­gre­di­ents Exerts its action deep within the skin to protect the epidermal stem cells for a lasting regeneration of the epidermis. Botan­i­cal com­plex Improves cellular communication (cross-talk) between the dermis and epidermis. The skin is moisturised and comfortable for 89% of users*. The skin’s radiance and youthfulness are preserved day after day: +46% hydration after 3 hours ** and continuous hydration for 8 hours**. * Self-evaluation performed on 39 people who used the Gel-cream or the Cream twice a day for 30 days (Gel-cream for 19 people + Cream for 20 people). ** Corneometry measurement, average on 24 people (Gel cream for 12 people + Cream for 12 people). Aqua(Water)-Glycerin-Butylene Glycol-Cetearyl Ethylhexanoate-Butyrospermum Parkii (Shea) Oil-Squalane-Dicaprylyl Carbonate-Xylitylglucoside-Tapioca Starch-Hydroxyethyl Urea-Anhydroxylitol-Stearyl Ethylhexanoate-Acrylates/C10-30 Alkyl Acrylate Crosspolymer-Acrylamide/Sodium Acryloyldimethyltaurate Copolymer-Urea-Boletus Aereus/Aestivalis/Edulis/Pinicola (Mushroom) Extract-Trehalose-Xylitol-Isohexadecane-Isopropyl Myristate-Lecithin-Parfum (Fragrance)-Sodium Dehydroacetate-Carbomer-Polysorbate 80-Sodium Hyaluronate-Tetrasodium EDTA-Sodium PCA-Serine-Sodium Hydroxide-Sodium Styrene/Acrylates Copolymer-Chlorhexidine Digluconate-Sorbitan Oleate-Pentylene Glycol-Polymethylsilsesquioxane-Algin-Hexylene Glycol-Polyquaternium-51-Caprylyl Glycol-Glyceryl Polyacrylate-Helianthus Annuus (Sunflower) Seed Oil-Potassium Sorbate-Xanthan Gum-Pullulan-Triacetin-Disodium Phosphate-Potassium Phosphate-Rosmarinus Officinalis (Rosemary) Leaf Extract-Chlorphenesin-Sodium Benzoate-Tocopherol-Sorbic Acid-Hexyl Cinnamal. 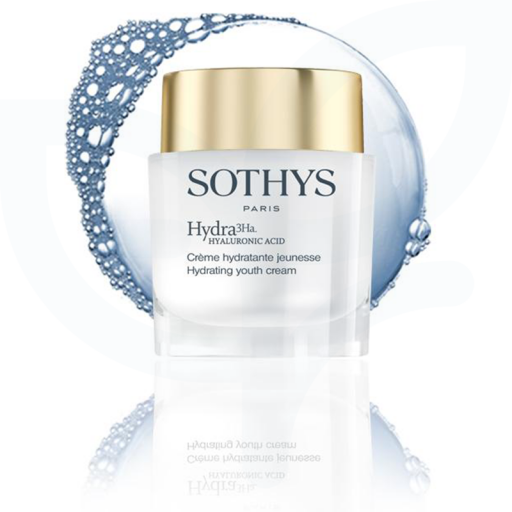 Apply morning and/or evening over the entire face and neck area following the Sothys Hydra 3Ha Intensive hydrating serum. My skin is very oily and this is one facial cream that I can use that is light but still hydrating. Highly recommend for oily skin. My skin was burnt and over-sensitive from using other common skin care products. Since switching to Sothy's my skin has returned to nearly normal and the redness is much reduced. The Hydra Gel-Cream is light enough to not cause break-outs but rich enough to leave my skin hydrated and soft.